Over half of the speech watchers, or 53 per cent, said there is no change in their confidence in Trump, the poll discovered. 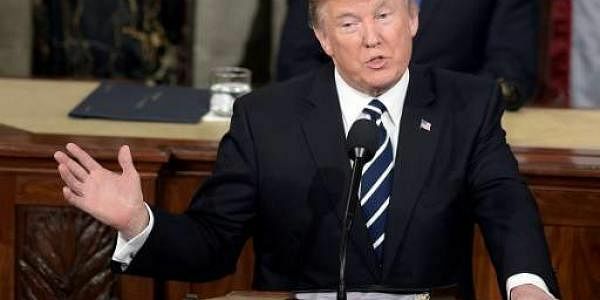 WASHINGTON: A solid majority of Americans, who watched President Donald Trump's televised first speech to Congress, said it was excellent or good, found a latest Gallup poll. It showed that 34 per cent of the speech watchers found Trump's speech to be excellent and 23 per cent of them said it was good. Twenty-five per cent said the speech was just OK, while only 7 per cent said it was poor and 9 per cent said it was terrible, Xinhua news agency reported on Sunday. As to the speech's impact on their confidence in Trump's abilities to carry out his duties as President, 36 per cent said it made them feel more confident, compared to 11 per cent who said it made them feel less confident. Nielsen television ratings for Trump's speech showed 48 million American viewers tuned in live for the speech, slightly lower than the 52 million viewers for former President Barack Obama's first speech to the joint session of Congress in 2009. There is a partisan gap in the percentage of viewers in terms of their party affiliation. While 85 per cent of Republicans and Republican-leaning independents said they either watched the speech live or read news reports about it, only 68 per cent of Democrats and Democratic leaners said they did the same thing. "Therefore, the positive reactions to Trump's address among speech watchers partly indicate Trump was successful in reaching out to and reinforcing his base," Gallup said in a report. But Trump's efforts to shift Democrats' views in a more positive direction do not appear to have been successful, Gallup found. A scant 5 per cent of Democrats said they became more confident in Trump after the speech, with 15 per cent saying they were less confident and 80 per cent saying it made no difference. By contrast, six in 10 Republicans said the speech made them more confident, Gallup found. President Donald Trump delivered his first speech to Congress on Tuesday night.